I have dedicated my life to working with wood with passion. I started early, and by the age of 12 I was dedicated to my father´s workshop where we restored antique furniture, musical instruments and more. My father, who was an art carpenter, did a great job of teaching me the old craftsmanship which I today highly appreciate, my goal is to expand my knowledge in the production of my instruments. 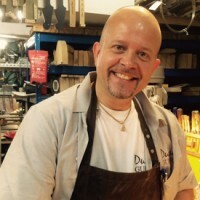 Dubré Guitars was founded in 1997. With a passion for wood and an ideology about what you see is what you hear, they want to preserve the legacy of good old craftsmanship, which typically will be recognized by the finest hand-build instruments.